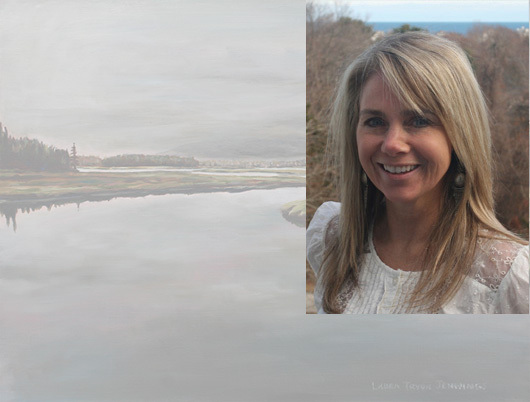 Laura Tryon Jennings is an award-winning New England artist with a resume that boasts nationwide exhibitions with an East Coast concentration and prominent collectors including, bestselling author Mary Higgins Clark, Grammy award winning singer Bruce Hornsby, news reporter Joan Lunden. Her work is also among the collections of Harvard University, Blue Cross Blue Shield, Merrill Lynch, University of Southern Indiana, Virginia Public Library, and HLM Venture Partners. She teaches oil painting at the Art Complex Museum in Duxbury, MA, Laura’s Art Center YMCA in Hanover, MA, and in her Marshfield, MA studio. She also facilitates expressive art workshops for a variety of populations along with having a private practice working with individuals to help promote self-discovery or working through a particular issue.